Last weekend I picked up the new HD DVD Player add on to the XBOX 360. 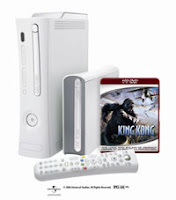 It comes with the player, a USB 2.0 cable, and the HD DVD of King Kong. The set up was a breeze. Within minutes of opening the box I had the unit up and running. Since my display will support 1080p I purchased the Xbox 360 HD VGA cable that will output 1080p. If you are thinking about doing this, don't bother. I was extremely disappointed with the quality of the VGA display coming from the XBOX 360. Many of the reviews I read about the cable indidcated it would be hit or miss, and for me it was definitely a miss. I also purchased U2's Rattle and Hum and V for Vendetta. The first being a music video, which is what I watch the most of at home, and the second being a recent movie I enjoyed through Netflix. I first threw in the U2 HD DVD and when the HD DVD introduction for Paramount began I could instantly see the huge difference between your average DVD and HD DVD. The best way I can describe it is it's as if someone finally corrected the focus knob. Things just look much cripser and clearer. I watched King Kong all the way through and in the long shots over New York or even on Skull Island the subject up front of course was clear, but so is everything else in the background. Jacki even commented on how it looked better than DVD. The other nice thing about this new HD format is the menus for navigating the features of a movie will show while the movie is playing. I never thought of this as something that was necessary but after doing it once you see how convenient it can be. I've been known to be an early adopter when it comes to these types of things. I purchased my first DVD player the month they came out, and it was so early on they were selling DVDs in only 7 cities, and my city at the time, Austin, was not one of them. Fortunately that early adoption worked for the best. I also bought into the Super Audio CD (SACD) format. Although the titles sound amazing the format never took off and only a handful of titles trickle out every few months. SACD was the victim of a format war with DVD Audio, which also failed. Now for the High Def DVD format war, HD DVD and Blu Ray, this is just like VHS and Betamax all over again. No telling who will win, but with the $199 price for the HD DVD add on I couldn't resist getting the full potential out of my TV. Sony didn't win the Betamax war, but only time will tell if Blu Ray will suffer the same fate.